Courtney Clark is the designer and maker behind Tinderbox. She is also a teacher, a dog mom and a lover of travel. Courtney lives in British Columbia, Canada and when she’s not crocheting you can find her enjoying the great outdoors with her pup, Boomer! 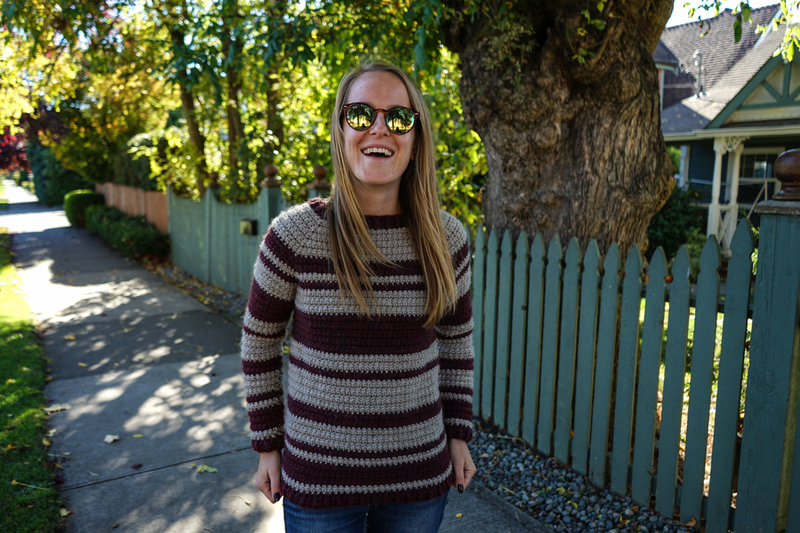 It’s Courtney the crochet designer behind Tinderbox. 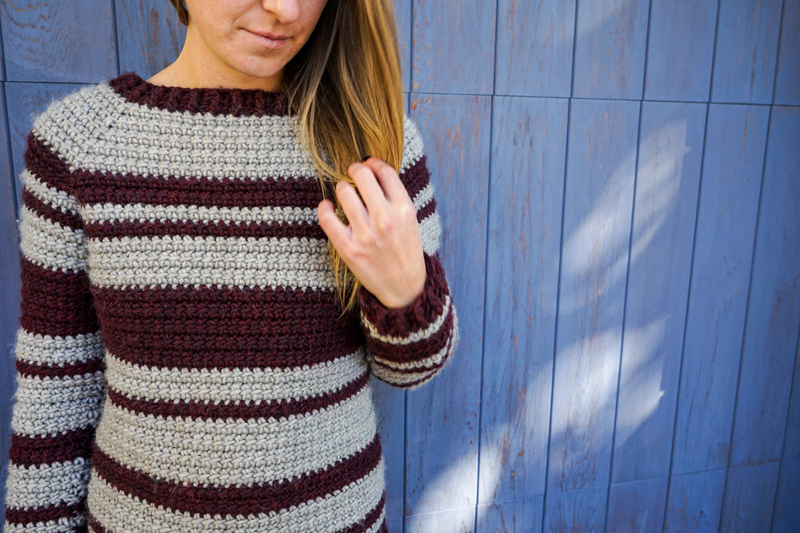 I’m so excited to be sharing my first ever raglan sweater pattern with you! What’s a Tinderbox, you ask? A Tinderbox is a little box that contains the components to make fire. My Tinderbox is filled with hooks, yarn, notions, and poorly drawn sketches. I began selling products at markets and in stores but have transitioned into designing, as that is where my true passion lies. My designs are intended to be simple, feminine, and beginner friendly for the most part. I like using stitches that you may not have seen or tried before. 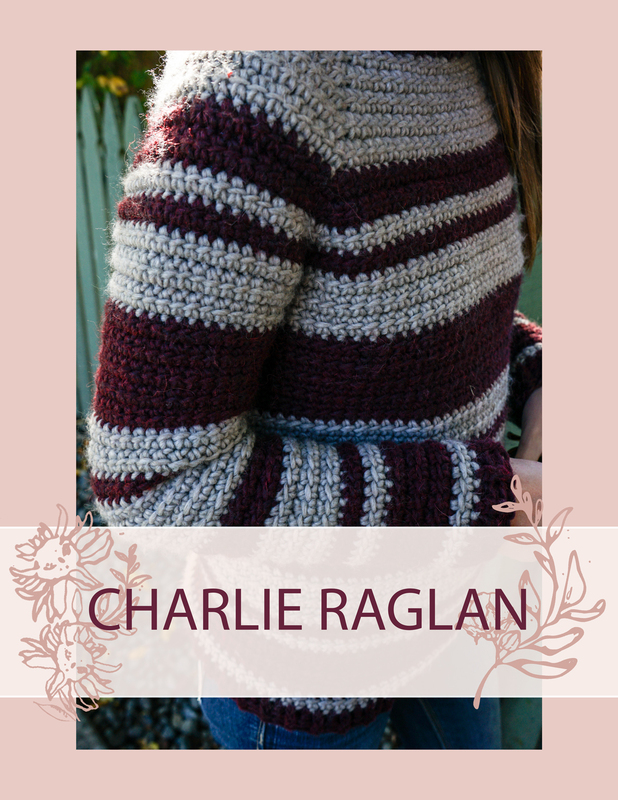 The Charlie Raglan uses a stitch that is a fun spin on a double crochet – the linked double crochet stitch. 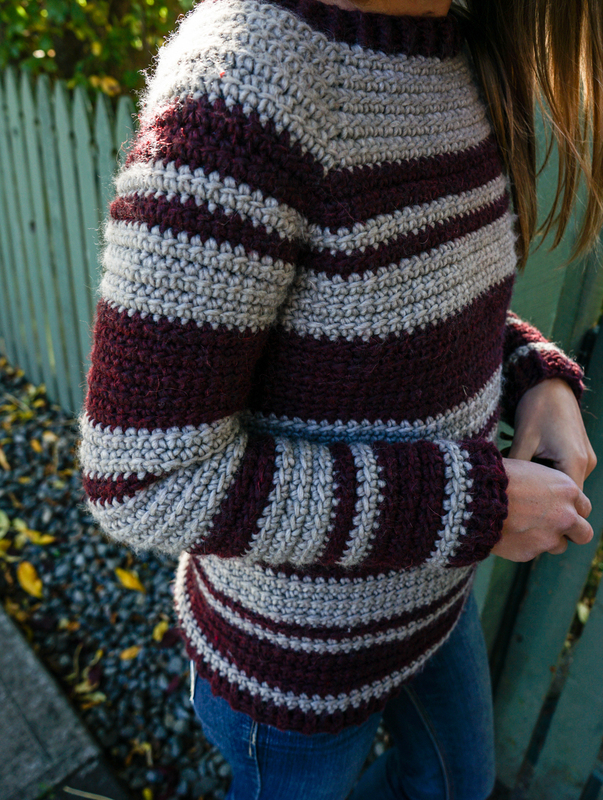 I hope you enjoy making this sweater as much as I did designing it! Happy making! If your gauge swatch is too small try using a larger hook or slightly thicker yarn. 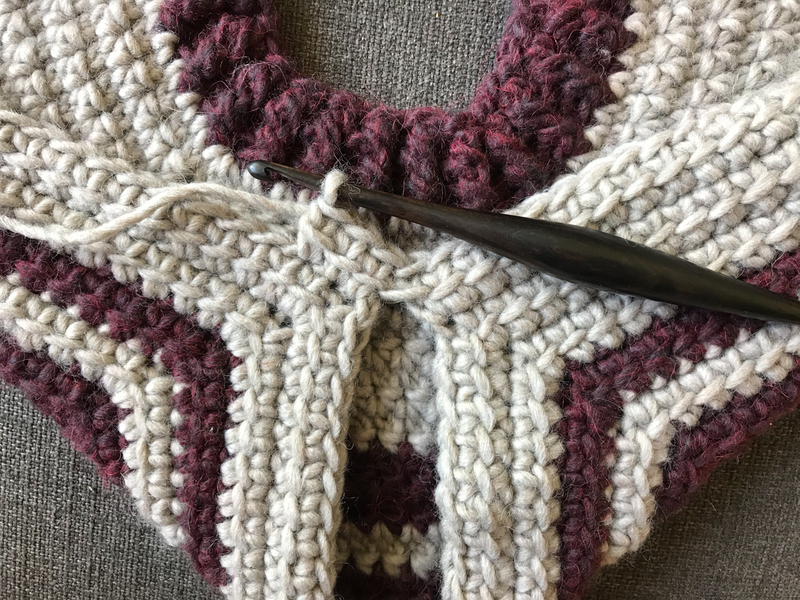 If your gauge swatch is too big try using a smaller hook or slightly thinner yarn. Sizes are noted as follows: S (M, L, XL) throughout the pattern. For random stripes make the following LDC rows in colour B 1-5, 8, 10-12, 18, 19, 21-24, 27-29, 31, and 35. All HDC rows are in colour A. For a tutorial on how to create the linked double crochet stitch (LDC) click here. Colour A: CH 64 (70, 76, 82). Join with a SL ST to the first CH. CH 2. HDC into the back bumps of each CH around. Join with a SL ST to the top of the first HDC. 64 (70, 76, 82) HDCs. CH 2. *FPHDC, BPHDC* around. 64 (70, 76, 82) STs. Colour B. CH 3. LDC into first 10 (11, 12, 13) STs. (LDC, CH1, LDC) into next ST, LDC into next 10 (11, 12, 13) STs. (LDC, CH1, LDC) into next ST. LDC into next 20 (22, 24, 26) STs. (LDC, CH1, LDC) into next ST. LDC into next 10 (11, 12, 13) STs. (LDC, CH1, LDC) into next ST. LDC into last 10 (11, 12, 13) STs. Join with a SL ST to the top of the first LDC. 68 (74, 80, 86) LDCs and 4 CHs. CH 3. LDC into each LDC and (LDC, CH1, LDC) into each CH1 space around. 76 (82, 88, 94) LDCs and 4 CHs. Repeat step 9 until you have 35 rows of LDCs in total. CH 2. HDC around. Join with a SL ST.
CH 2. *FPHDC, BPHDC* around. Repeat step 12. Fasten off. Weave in ends. Note: Steps 14 through 22 are to be repeated twice, once for each sleeve following the same striping pattern as the body. Note: If you prefer straight sleeves proceed without the decreases, if you prefer a looser sleeve at the top begin the decreases around the elbow instead of from the top. CH 3. LDC2tog then LDC into each stitch around. Join with a SL ST.
CH 3. LDC around. Join with a SL ST.
CH 3. LDC around to the last two stitches, LDC2tog. 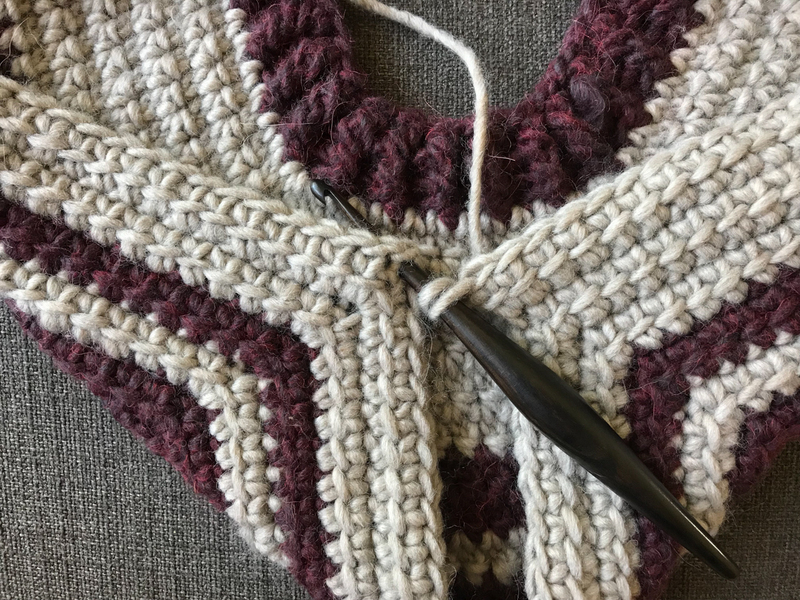 Join with a SL ST.
Repeat steps 16, 15, 16, 17 until your sleeve is the same number of rows as the body prior to the ribbing. For best results stop doing the ribbing a row early if you have an even number of stitches in the round. 22 (26, 30, 34) is the optimum stitch count, but any even number will work. Fasten off, weave in ends. Repeat for second sleeve. Seam together the gaps up the back and inside of the arms. My preferred seaming method is the mattress stitch up the inside, it ends up totally hidden. 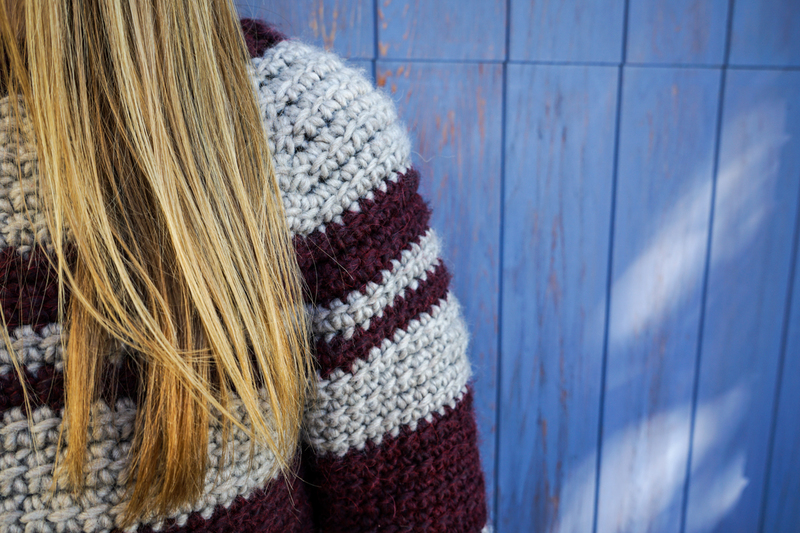 I hope that you enjoyed making this sweater and enjoy wearing it even more. I know I’ll be cozied up with a tea next to a fire snuggled in my Charlie raglan many times this winter. If you’re interested in seeing what other designs I am cooking up you can visit my website or check me out on Instagram.